The original Obstruction Rule was no more than a sentence which set out a prohibition on a tackler running between a player in possession of the ball and the ball (generally while attempting to tackle), but this idea was also combined with what was later called third party obstruction. There was no distinction made between these two forms of obstruction. No mention at all was made of a player in possession of the ball obstructing a tackler. 12.1 (j) A player shall not obstruct by running between an opponent and the ball or interpose himself or his stick as an obstruction. A player who runs in front of or blocks an opponent to stop them legitimately playing or attempting to play the ball is obstructing (this may also be third-party obstruction). This also applies if an attacker runs across or blocks defenders (including the goalkeeper) when a penalty corner is being taken. The current version of the Obstruction Rule does acknowledge the existence of obstruction by a player in possession of the ball even if the modern umpire very seldom does. In the picture below the PIP who is facing the left side-line, is sidestepping towards his own goal while shielding the ball to block off the defender and prevent a tackle attempt, this is contrary to Rule. A player who blocks an opponent to stop them legitimately playing or attempting to play the ball is obstructing. • Is there active movement to prevent the playing of the ball? All games are defined by the Rules they are played to. The players in the picture below might be playing a game called stick-ball, or something similar to hurling but with a hockey stick and ball (so not hurling). They are not playing field-hockey even if most of the skills employed in the play are similar to those of field-hockey, because a fundamental Rule of field-hockey is being ignored by all – officials as well as players. We move into 2019 with the FIH Rules Committee once again having failed to grasp the opportunity to put right some major flaws in the Rules of Hockey. Here I take another detailed look at the wording of the present advice and Obstruction Rule as set out in the UMB and the Rules of Hockey, and point out some simple but, I think, desirable, amendments to clarify them without significantly changing the Rule. All suggestion, even if it might look new and completely alien, is taken from principles which were previously set out in the Obstruction Rule or given as advice to umpires post 1993. ∙ Are the players trying to play the ball? ∙ Is there a possibility to play the ball? Are the players trying to play the ball? That cannot reasonably refer to a situation where an obstructing player is in controlled possession of the ball. This is a trivial point and does not make a significant difference to the possible understandings of the question put, if common sense is used, but not all of the ambiguities are trivial. Is there a possibility to play the ball? Presumably, the writer means:- Is a player who might claim (or is claiming) to be obstructed in a position from which he could play at the ball? The UMB, in the advice on tackling, warns umpires against pre-judging where a legal tackle could possibly be made from, so it is acknowledged that this is not always an easy decision to make and a tackler can often attempt to play at the ball from what looks to an umpire to be an impossible position. This seems to me to be a way of denying that an obstructed player is obstructed because he or she might actually somehow be able to play at the ball, even if it looks unlikely that that is the case. It gives a ball shielding player great scope in positioning between an opponent and the ball, I think too much scope in most instances. Is there active movement to prevent the playing of the ball? There is a syntax error there, it is not possible to make an inactive movement, movement is an activity. The word “active” is redundant. This minor error is a pity because it spoils the flow of one of the most important pieces of advice in the UMB. An umpire might pause to consider what an active movement is. Is it a movement that is relevant rather than irrelevant? This sentence is, however, problematical in another way, it gives the impression that the illegal prevention of a tackle attempt, i.e. obstruction, depends entirely on there being a movement to obstruct by the obstructing player, a point I will come back to. That is better in one way (there is no suggestion that movement is necessary for there to be an obstruction offence). But what does “Be aware” mean (penalise?) and why is the word “professional” inserted in the statement? That is an insult to professional players. The advice given about the penalising of stick obstruction is also unnecessary, an umpire should not penalise for any offence unless he or she is certain that it has occurred, but should not fail to penalise when a team is disadvantaged by the illegal action of an opposing team player. We are then presented with Explanations of Application of the Rule, set out in several clauses most of which are definitions of obstruction. We are also provided with an Exception to the Rule. Unfortunately, many of these clauses are badly constructed or incomplete or both. This apparently uncontentious instruction has proved to be extremely contentious because of the way it has been interpreted, something that would not have been an issue, if it had been properly written and explained, has turned the application of the Obstruction Rule ‘on its head’. I have written more than one article on this matter. Here is one, reading it and looking at the videos within it will be helpful. I will place links to other articles about the Obstruction Rule at the foot of this article. Put briefly, this clause does not say or mean back into contact with an opponent and I have put the case for interpreting it to mean ‘back into the playing reach of an opponent, while shielding the ball from that opponent, to prevent a legal tackle attempt being made’ longer but unambiguous and accurate. – physically interfere with the stick or body of an opponent. The Rules about physical contact are duplicated and ‘pop-up’ all over the place in the Rules of Hockey and this is but one example of this repetition, but it is true that these actions may also constitute an Obstruction offence. When combined with “back into an opponent” we have both two obstruction offences and possibly two different physical contact or interference offences, to body and to stick. To see them all together (unpenalised) watch a shootout in almost any senior match decided in this way. The video below is of a high school championship and demonstrates the complete unawareness of the Obstruction Rule that is now typical in hockey, world wide. This may be directly attributed to the poor standard of umpire coaching disseminated by FIH Umpire Coaches in this area of Rule. Here is another vitally important clause spoiled by a poor word choice. The word “from” is just ‘skimmed’ and accepted as is for no better reason than the fact that it is contained in a long-standing phraseology. But its use makes no sense at all, in fact takes the sense away from the ‘sentence’ because it is generally the case that no tackle can be attempted, never mind a legitimate (legal) one, when the ball is shielded (to prevent a legitimate tackle) by a player in possession of it. It would make good sense if the clause was written ‘Players obstruct if they shield the ball to prevent a legitimate tackle with their stick or any part of their body. This is one of the very few examples of better word use in the UMB than is given in the Explanations of Application of the Rules. It should be noted (going back to my point about the absence of need for a movement to obstruct an opponent) that there is no mention of any movement by the obstructing player in this clause. Shielding the ball to prevent or delay an opponent attempting a legal tackle – because a tackle is made impossible, due to the ball shielding, for the intending tackler to immediately make a tackle for the ball, is an Obstruction offence. Advice used to be given in the rule-book to umpires that an obstruction occurred when a tackler who would otherwise have been able to play at the ball could not do so because it was shielded by the body or stick of an opponent. That sensible advice mysteriously (that is without any reason being offered for its deletion) disappeared. In compliance with existing Rule, defenders who attempt to run-down time by holding the ball in a corner in their own half, should be penalised with a penalty corner (and a yellow card) and those who ‘crab’ the ball along their own base-line to ‘protect’ it from opponents while taking it out of the circle, with a penalty-stroke. Intentional offences should be penalised more severely. This Rule Exception is what is left of what in 1993 was mistakenly called the ‘New Interpretation’ of the Obstruction Rule, which at the time, was set out over three pages in the Rule Interpretations section in the back of the rule-book. Also ridiculous was the “onus” on a tackler to position where a tackle could be attempted and then to make a precise play at the ball with the stick (often an impossibility because there was nothing to prevent the ball holder moving to maintain a ball shielding position. The blatant obstruction of the goalkeeper which usually occurs during shootouts is condoned by suggesting that the GK made no attempt to play at the ball, even when to legally do so was an impossibility). But there was no mention of any onus on a ball-holder not to obstruct an opponent who was within playing distance of the ball and demonstrating an intent to make a tackle. All this heavily slanted ‘new interpretation’ (which was the extreme opposite of previous practice and not just a reasonable modification) was struck out of the rule-book in 2004, but there are still today umpire coaches, who were probably active umpires in 1993 and after, who continue to coach to new umpires the ‘interpretation’ extant at that time – which was basically, if a tackler could not play directly at the ball he or she could not be obstructed. The flaw in that approach should be obvious to all, the illegal prevention of a tackle attempt was not considered at all in a Rule which should have been about exactly that. To be clear, I think the introduction of protection for a ball receiving player was an excellent idea because it opened up tactical opportunities, which had existed before (as the German teams under Paul Lisseck had demonstrated) but which were very rarely used. I do not want to go back to a situation where all a marker had to do to win a free ball was clatter into the back of an opponent who was receiving the ball while pretending to be attempting a tackle. That said the protection given to a receiving player, a temporary exemption from the Obstruction Rule, must not be extended into the play after the ball has been received and controlled. I am then in favour of the original “must move away” rather than the present “is permitted to move off” which is neither directive nor prohibitive, so a choice between opposites and not a Rule instruction at all. A player with the ball is not permitted to move bodily into an opponent or into a position between the ball and an opponent, who is within playing distance of the ball, in a position of balance to make a tackle, i.e. not facing or reaching in the wrong direction, and is demonstrating an intent to play at the ball. Having received the ball a receiver must then, without delay, either play the ball away or immediately move with the ball away from opponents, to put and keep it beyond the playing reach of any opponent. Keeping the ball beyond the playing reach of an opponent may include eluding a tackle attempt by an in-range opponent as long as the ball is constantly kept open to that opponent and not shielded in any way, with body or stick, that prevents a legitimate tackler attempt. And finally we have the afterthought, which was at one time, all that there was of the Obstruction Rule. That clause is and always has been a muddle of two very different kinds of obstruction. The word “also” is also in the wrong place. But importantly it does state that a player who blocks an opponent to prevent that opponent attempting to play at the ball is obstructing. A player who runs in front of or blocks off an opponent to stop them legitimately playing or attempting to play the ball is obstructing (this may also be third party obstruction). Third party obstruction may occur if an attacker runs across or blocks off out-running defenders (including a goalkeeper) when a penalty corner is being taken. It is not necessary for the obstructed player to be within playing distance of the ball at the time a third-party obstruction occurs, all that is required for offence is the prevention of opportunity to intercept the ball or challenge an opposing player for the ball, when but for the obstruction the obstructed player would have been able to achieve one or other of these objectives. The Rule on ball-body contact – 9.11 – could also be reconstituted and greatly improved with a combination of current and previous wording, but it really needs a new approach. That basically is a focus on ball-body contact by a player in possession of the ball rather than by a tackler or defender hit with the ball. Elephants in the Room. We have recent Rule changes, like the facility to play at the ball above shoulder height, which ought to be far more restrictive than they are and some ancient Rules (written back in 1908) which are no longer fit for purpose. Links to some other Obstruction Rule articles. There are also many articles about other Rules in which I make reference to the Obstruction Rule or post videos of examples of breach of it, but attempting to read through the above list should be enough to make you as crazy as I am. The coach, Jan Hadfield (above), speaks as if attempting to ‘manufacture’ an obstruction offence is a common occurrence, when it isn’t now (but it was up until the 1970’s), it now seldom happens (it is generally a waste of effort anyway because obstruction is so seldom penalised). The most common obstruction by far is by a ball holder who illegally shields the ball from an opponent to prevent a tackle attempt, but she does not mention this type of obstruction at all. It is ignored, perhaps in order to “take the whistle out of the game”. Examples of this kind of ‘application’ are seen in the videos below. Umpires should not of course interrupt the game with the whistle to award penalty more than is necessary, but they also should not fail to award penalty when it is necessary (required by Rule) that they do so. What I have written in the opening paragraph may seem to be a bit harsh, but aside from the evidence of practice seen in the videos, which is not at all unusual, there is the writing of the Rules as published (that is piecemeal – bits being added or deleted over the course of years without any editing or incorporation or consolidation of the existing text) which results in conflicts and contradictions and absurd assertions, which I have only touched upon in the two videos above, to support that view. The Obstruction Rule is a case in point. As I demonstrated in the first video. The major rewrite of 2004 left us with three bullets points under the heading ‘Players obstruct if they’; to those there can be added another four points, two from what is written (badly) about third party obstruction and two from the paragraph which was extended by amendment in 2009 (to prohibit a player moving to position between an opponent and the ball) ; this ‘tightening up’ which prevented players who were “moving away in any direction” shunting sideways with the ball to maintain a ball shielding position, was the last amendment made to the Obstruction Rule. But then in 2002 Advice to Umpires in the rule-book (which was also presented in the 2002 Umpire Managers Briefing), contained three sensible additional points (or sub-points) that simply disappeared in the 2004 rewrite without ever making it into acceptance in what is termed Full Rule. Part of what was deleted in 2004 (from the 2002 advice) was restored in 2009 but the language used is (it’s still there) not as specific i.e. it is vague. There are a total of ten possible “Players obstruct if” bullet points (with some overlap and repetition) – and these do not specifically cover the two circumstances (aside from ‘manufacture’) in which an obstruction offence is an impossibility, one of which (on-side of the ball and the player) I try to explain in the second video above (the other being when an opponent is receiving the ball – because receivers, moving or stationary, are permitted to be facing in any direction). In the days when a receiving player could be guilty of an obstruction offence (pre -1993) the best time to attempt a tackle, other than an interception before the ball reached the intended receiver (which is still the most advantageous way to gain possession), was as the ball was being received. In those circumstances obstruction was always seen as occurring before the tackle attempt and the obstructing player penalised if the tackler was or came to be within within playing reach of the ball before the ball was played away or the receiving player moved away to keep it beyond the playing reach of opponents (so considerable skill, besides collecting the ball, was required of a player receiving the ball – which is no longer the case). The ‘new interpretation’ (in fact an exception to the Obstruction Rule) reversed this situation. A receiver no longer needed to make a lead run to create time and space to receive the ball and among the worse times to attempt a tackle was (and is) as the ball was being received (these days such a tackle attempt is likely to be regarded as a contact offence even when there is no contact made). A player already in controlled possession of the ball, but shielding it, is in an even stronger position if the umpire sees no genuine and legal attempt to play at the ball by a tackler – and what constitutes an attempt to play at the ball might actually be an impossibility when the ball is shielded to prevent such a thing happening – this is a circular situation, but one that is usually interpreted to the ball-holders advantage (which is hardly fair). The video immediately below is a clip that was published by the FIH Umpiring Committee via the dartfish.com website. 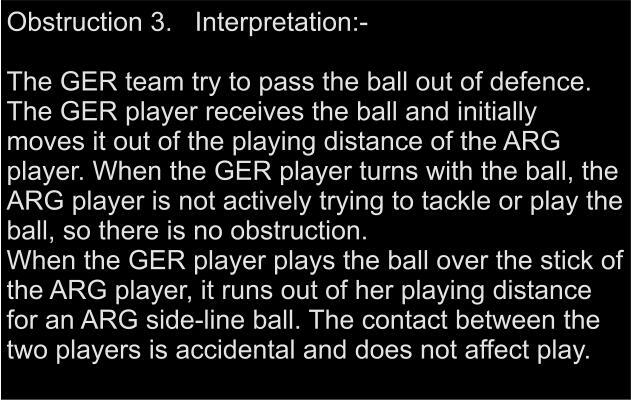 The ‘Interpretation of the action’ provided with it failed to describe most of the action which occurred between the time the GER player received the ball and when she had completed her turn about it, to once more face the ARG player, but concluded that the ARG player made no attempt to play at the ball and so could not have been obstructed. Such coaching can only cause great confusion, as the tackle attempts made by the ARG player are obvious, as is the deliberate blocking off of the ARG player by the GER player (it was with much relief that I discovered recently that the FIH Umpire coaching videos that were produced are no longer available on that website. It was infuriating to see such a potentially valuable coaching tool so badly produced. It will be interesting to see what, if anything, replaces them.) I have overwritten this clip with my own comment.This is the interpretation of the action that was provided with the video by the FIH Umpiring Committee (in fact whoever they appointed to do the job). The only thing that was (and is as a lone player) even worse than attempting to tackle a player in the act of receiving the ball was (is) to attempt to go around a player receiving the ball to try to make a tackle. That simply provided the receiver, then in control of the ball, with opportunity to turn away to the other side and into the space just vacated by the player attempting to tackle. Whoever drafted the conditions of the ‘new interpretation’ clearly had no idea what was involved when defending or tackling during a hockey match. There is no onus on the opponent of a receiving player to make a tackle attempt, there cannot be, and there certainly should not be direction given that a tackler must go around a ball holder to make a tackle attempt (or even the impression given that this is the case). In most circumstances sensible defenders will try to block movement by an opponent with the ball and hold their ground until they have sufficient numerical advantage to actively confront a ball holder and try to win the ball without the risks associated with loss of defensive position. This is of course not a hard and fast statement, a forward will try to tackle a full-back in possession of the ball in the full-back’s own circle whenever the opportunity arises, but in general defenders do not rush to tackle forwards outside the 23m area, when the attackers have good control of the ball and unmarked support, that is just common sense. Reducing cognitive dissidence; wilful blindness and confirmation bias. “Let us consider that we are all partially insane. It will explain us to each other; it will unriddle many riddles; it will make clear and simple many things which are involved in haunting and harassing difficulties and obscurities now.” Mark Twain. I have been driven mad trying to make sense of the the Rules of Hockey, when compared with the current (sic) application of them, particularly the Rules concerning a dangerously played ball, ball body contact and obstruction. I have no difficulty at all in accepting that those who wrote these Rules are not quite sane and that I should feel sorry for them, as well as joining them. This article is an attempt to unravel the history of the Obstruction Rule and explain how it came to be written as it now is. I will not attempt to explain why it is applied as it currently is, because it is impossible to explain the contradiction of literal word meanings or to reasonably explain irrationality or willful blindness (other than in the legal sense of the term), but examples of current practice will be shown in video and comment about current practice will be included. The 1986 Rules of Hockey provided the following Rule and Guidance about obstruction. At the time there was nothing on the subject given in Advice to Umpires (a separate section at the back of the rule-book). I am not certain in which year the following Guidance for Players and Umpires was first written but it was the same in 1958 (a year for which I have a copy of the Rules) and probably for a considerable number of years before that. I chose 1986 as a start point because in 1987 Advice to Umpires included in the rule-book for the first time advice on the application of the Obstruction Rule. (k) obstruct by running between an opponent and the ball nor interpose himself or his stick as an obstruction. Obstruction was at this time regarded by the FIH HRB as an offence that a tackler, rather than a player in possession of the ball, was the more likely to commit, but that was a ‘traditional ‘ view which did not fit with fact. Then as now the majority of obstructive offences were ball shielding (to prevent an opponent playing directly at the ball) by a player in possession of the ball. In recent years obstruction by tackling players, usually referred to as ‘breakdown tackles’ and generally committed together with a physical contact offence have become more common. In the Umpire Briefing video produced for the 2016 Rio Olympics concern was expressed about this kind of obstructive contact and umpires were instructed to watch for and to penalise it. There are some startling examples of umpires doing the opposite, even penalising the player in possession or about to get possession of the ball after he or she had been obstructed and physically impeded. Examples of Obstructive tackling. 1) Penalty against the wrong team and personal penalty against the wrong player 2) No penalty, despite video referral (When a penalty stroke ought to have been awarded). 1986 Guidance for players and for umpires. (prior to 1995/6 set out in the rule-book as far as possible on the page opposite the page on which the Rule Proper was printed). L2.1 (j) (k) Body Interference and Obstruction. Subject to the “advantage rule” umpires should be particularly strict on obstruction and other forms of interference dealt with in this Rule. It should be noted that obstruction does not necessarily depend on the distance from the ball of the players concerned. A player, even if in possession of the ball, may not interpose his body as an obstruction to an opponent. A change of direction by a half-turn of the body with this result may amount to obstruction. It should be noted, however, that even a complete turn does not constitute a breach unless an opponent has thereby been obstructed in an attempt to play the ball. The above clause could usefully be included in the current Rule. Obstruction occurs at hit-ins and should be watched for carefully. (the ‘tram-line’ which ran parallel to the sidelines at a distance of 7 yards – all players had to be outside of it when (first a roll-in from the hand) and then a hit-in from a side-line took place – was done away with long before 1986, but the associated Guidance remained in the rule-book. It is possible that it was left in place to save on reprinting costs and umpires were told during verbal briefings to put a line through it (something they are now used to doing with other Rule clauses – even if only in their heads). A player must not interpose any part of his body or his stick as an obstruction between his opponent and the ball. Watch too for third party interference i.e. a player interposing himself between his opponent and the ball so that a fellow player has an opportunity to clear or play the ball. A player may not place any part of his body or stick between an opponent and the ball. Such actions are called obstruction and may also be referred to as screening the ball or blocking. (c) the ball is within playing distance or could be played if no obstruction had taken place. (a sentence, particularly the second part of it, that could usefully be included in current Rule ). Obstruction may result from the actions of a player from the same team who does not have possession of the ball preventing an opponent from playing the ball. This is known as third party obstruction. Not every situation, when a player finds himself between an opponent and the ball is obstruction. To obstruct, a player must be active. He will have to move to place himself between his opponent and the ball. If the aforementioned conditions are not met, there can be no grounds for penalising a player for obstruction. The above clause was the introduction of the idea (it was not Rule but advice given to umpires) that to obstruct the obstructing player must first have moved into a position that obstructed an opponent (rather than a player intent on tackling for the ball moving towards an opponent in possession of the ball). It later found expression in the meme “A stationary player cannot obstruct” and proved to be a stumbling block to the writing of a rational Rule. The idea was later defended by some who declared that a stationary ball holder wasn’t doing anything – shielding the ball while remaining stationary wasn’t considered by these people to be an ‘active’ obstruction – i.e. an action. However being hit with a hockey ball isn’t usually the result of an action taken by the player hit but penalty generally follows (even when it shouldn’t), so was the demand for ‘activity’ reasonable when a tacker was clearly prevented from playing at the ball only because it was deliberately shielded from him or her? I think not. This clearly obstructive play, with both stick and body, was not recognized as an obstruction offence because there was no attempt to make a tackle – but neither, because of the ball shielding, was there any possibility of the opposing player playing directly at the ball, even though within playing distance of it. Players who run into the back of an opponent or by any other means try to create the impression that they are being obstructed can be penalised under Rule 12.1(1) (The ‘manufacturing’ offence which preceded the offence of Forcing). The above “or by any other means try to create the impression that they are being obstructed” was also irrational, because a tackler was (is) obliged to demonstrate they were (are) trying to play at the ball in order to be awarded a penalty against an obstructing player, i.e an obstruction offence has to be forced by means of a legitimate tackle attempt: obstruction cannot otherwise occur – a conundrum is created by the above clause. This example, below, from a match played in the past few weeks, demonstrates the weakness of ‘active’ or ‘movement’ arguments. The defender in this case should have been penalised with a penalty corner, there is nothing accidental about his obstruction of the opposing forward. The umpire was oblivious to the offence – trained blindness. Rule and Guidance was as previously given above. This was the year of the introduction of a so called “new interpretation” of the Obstruction Rule, which was not a new interpretation of obstruction at all but an exemption or exception to the Rule granted only to a player who was in the act of receiving and controlling the ball. The current clause is read and interpreted and acted upon as if the word “receiving” is not contained within it: that is players in possession of the ball are permitted to face and move in any direction irrespective of the presence and positioning of opposing players who are trying to play at the ball from within playing distance of it – which is simply wrong. Interpretation of obstruction in hockey has changed significantly over the last few years. The main reasons for this are the increased use of artificial pitches on which the ball and player can change direction quickly, a desire to let the game flow and a wish to develop and protect skills on the ball. The reasons given in the above clause for change to interpretation were untrue and silly, interpretation of obstruction changed because it had been declared in 1987 that a obstructing player had to move to position between an opponent and the ball in order to obstruct; that was interpreted to mean that players who were in possession of the ball, but stationary, could not obstruct. This was a dramatically different approach from what had gone before, but there was no acknowledgement of this fact other than to, wrongly, declare that there was a new (very poorly explained) interpretation. There followed some ‘woolly’ statements that demonstrated that the writer knew little about playing hockey (particularly as a defender). There was also the presentation of one way of looking at obstruction (without considering any others). Why ‘The Stationary Player’ and ‘The Moving Player’ were chosen as divisions for Rule Interpretation, is a mystery to me. ‘A Receiving Player’ (the subject of the exception) and ‘A Player in Possession of the Ball’, are I think much more appropriate divisions of circumstances in what was to be a new approach to Obstruction (the introduction of a single exception to the usual application of the Rule). The receiving stationary player may be facing in any direction. The onus is on the tackler to move into position, i.e. usually to move round the receiver, to attempt a legitimate tackle. The only time an opponent can reasonably move round a player receiving the ball is when the ball is still a considerable distance from the intended receiver and there is a strong possibility of making an interception before the ball reaches him. Thus the tackler must not crash into a receiver and thereby try to.claim obstruction, any such action should be firmly penalised. The last above clause conflicts with the previous Rule Interpretation statement that a stationary player cannot obstruct. It is also very vague. What does “away” mean? (Away from a opponent intent on making a tackle for the ball?) When? How far away? At what speed? For what purpose? Accordingly, the receiver is being allowed to collect the ball and proceed with play – with the onus on the tackler to move into position where an attempt can be made to play the ball without contact with the receiver. The variations in this instance are vast – so a few principles for making the necessary judgement are suggested. From here on the advice about application of the Obstruction Rule is not about obstruction but about what a tackler must do to avoid a physical contact offence. One way of summarising these principles is to consider the position, intent and timing of the tackler. Just as with the stationary receiver, the onus is on the tackler to be in, and if necessary move to, a position from which a legitimate tackle can be made. Even once in the correct position, the following conditions must also be satisfied before obstruction occurs. There must be an intention to make a tackle. In essence, the tackler must be attempting to move his stick towards the ball. The timing of this movement of stick towards ball must be precise – because until the moment the tackler is in a tackling position and intent on making the ‘tackle, the player with the ball can move off with the ball in any direction. This demand for precise movement of the stick towards the ball at the right time and from the right position destroyed the Obstruction Rule. There was nothing to prevent a player in possession of the ball at any moment moving the ball to maintain body shielding of it or at any moment, from moving (turning) so that the tackler who was about to achieve a position from which a tackle could be made, was no longer able to achieve such position. The tackler who was trying to position to make an attempt to play directly at the ball (“usually to go around the player in possession”) could be made to be like ‘a dog chasing his own tail’ without the ball holder having any fear of penalty for obstruction. An attempt by a tackler to go around a ball holder to position to make a tackle, simply offered opportunity to the ball holder to turn away with the ball to the opposite side, easily preventing any tackle attempt and simultaneously ‘beating’ the defender while maintaining ball shielding. Defenders then had no option but to stand-off a receiver of the ball who remained stationary or a ball holder who had turned to shield the ball from them but did not then move away. To attempt a tackle was to invite penalty for physical contact (the ball-holder could easily make sure of that) or just as easily turn into the space vacated by the tackler. This is the essence of the current interpretation of obstruction: allowing a player to receive a ball, play or pass it in any direction, and only penalising him if obstruction takes place at the time a properly-placed tackler is intent on making the tackle. It is clear from the above clause that ‘a receiving player’ was, until the ball was in control (a very short period in top level hockey), exempt from what would usually be regarded as an obstruction offence, but that obstruction by a player in possession was then a possibility. It is the illegal (because of ball shielding) prevention of a legitimate (non-contact) tackle attempt, when but for the ball shielding, an opponent who is demonstrating an intention to play at the ball, would be able to play directly at it, that is the ‘essence’ (the critical criterion) for an obstruction offence. That was true in 1993 and it is true now. The 1993 ‘new interpretation’ of obstruction did not specifically mention a player in possession of the ball illegally preventing an opponent from playing directly at the ball – it concentrated on tacklers and mentioned obstruction in passing, without explaining what obstruction is. It was in other words, nonsense. What constituted obstruction by a player in possession of the ball did not change at all in 1993 (or later). But a major difficulty for umpires was judging the moment a receiving player became a player in controlled possession of the ball (and therefore subject to the Obstruction Rule). They ‘solved’ this difficulty by ignoring it, players who were obviously no longer in the act of receiving and controlling the ball but had it in close control (were moving it from side to side with the stick), were permitted to continue to shield the ball without moving away (or even attempting to move away) from an opponent who was intent on making a tackle for the ball – today we have umpire coaches instructing that a player in possession of the ball can legally back into opponents (back into their playing reach) as long as they do not back into physical contact and this opinion is based on nothing more than a quirk of language, the analogy – that a car that backs into another car makes contact with that car (how daft this is as a basis for interpretation for obstruction can easily be illustrated by extending the same analogy, the driver of a car who backs his car into a parking bay or a home garage does not normally keep going until he hits something) . That is, the player with the ball can play hockey and is penalised only if Obstruction is actual rather than implied. ∙ physically interfering with the sticks or bodies of opponents. There was a reformatting of the Rule and Rule Guidance after 1995. The Guidance to each Rule, previously given on the facing page, was not changed at this time but hereafter presented beneath the relevant Rule in italics. There were two changes to Appendix B Rules Interpretations pertaining to obstruction. Having collected the ball the receiver may move away in any direction (except, of course, bodily into the tackler). Here the word “must” was replaced with “may”. This was a huge change although it might, being a change of only one word, appear to be insignificant, but a prohibition (against remaining stationary) and a directive (to move away), were deleted and replaced with a choice. A receiving player having received the ball could now remain stationary if they so wished. This change also removed the conflict introduced in 1993 (the contradiction of the 1987 stationary player meme) but it would have been much better if the 1987 statement which effectively declared that a stationary player could not obstruct had been removed instead of the ‘fudge’ in the above clause being introduced. At the time it was made the change of word from “must” to “may” was incomprehensible to me and I wrote to the Hon. Sec. of the FIH HRB about it – without reply. In hindsight, a distance of many years, I can see that it was made to address the 1993 contradiction of the 1987 statement and maintain that statement, a double error that effectively ‘gutted’ the obstruction Rule. This was added at the end of the 1995 Interpretation of the Obstruction Rule. Preventing a legitimate tackle by intentionally and continuously shielding the ball with the body or leg is obstruction. Stick obstruction and interference is prohibited; no player may strike at or interfere with an opponent’s stick. The player with the ball may not use the stick actively to shield or protect the ball from a legitimate tackle. The inclusion of the words “continuously” and “use the stick actively” was worrying but no explanation of either phrase was offered. I believe it was from ‘use the stick actively’ that the odd idea that stick obstruction could not occur if a player had his or her stick-head in contact with the ball, first arose. Umpires have proved capable of ignoring entire paragraphs in a Rule but, then extrapolating an ambiguous phrase from Interpretation into a new (and unofficial) Rule or Rule Interpretation. By 2002 the officiating of the Obstruction Rule had become such a shambles, that what was by then called Appendix B Rules Interpretations, was revised to include some objective criteria to judge if an obstruction offence was taking place. The Rule wording and the structure of the Guidance and Rules Interpretations remained the same. The interpretations of obstruction below allow players to receive a ball, play or pass it in any direction, and only to be penalised if obstruction takes place at the time a properly placed tackler tries to make the tackle. Then for the first time a description of some of the actions that might objectively be considered to be obstructive actions (actions that had by that time become commonplace) was included in Rules Interpretations. There were of course those with their own agendas – who believed the obstruction Rule ought to be deleted – and who declared on Internet hockey forums that “be aware” did not mean “penalise” (they themselves were not penalising any of the listed contraventions) even though some of the “be aware of” actions that were listed in this Rule Interpretation were mentioned in Guidance as offences. (which rebutted previous Advice to Umpires “To obstruct, a player must be active. He will have to move to place himself between his opponent and the ball. If the aforementioned conditions are not met, there can be no grounds for penalising a player for obstruction” and also rebutted the 1995 change from “must” to “may” – because if a played is not permitted to stand still and shield the ball when under pressure, then he or she must either move away or not shield the ball if stationary, as a tackle attempt is being made. A see-saw. Perversely, the above clause, instead of deterring stationary shielding, which generally remained unpenalised, led to the idea that a player who was moving with the ball (or even just moving the ball) could not obstruct, so we had umpires, sincerely believing (because that was what they were coached) that a stationary player in possession of the ball could not obstruct and nor could a player who was moving the ball or moving with the ball. These umpires apparently did not suffer from cognitive dissidence (an uncomfortable feeling that their belief was being contradicted by fact – what was written in the rule-book) and they saw no reason to do anything to reduce dissidence. Their common sense apparently did not tell them that if all the above statements were true then there was in effect no Obstruction Rule because obstruction (except maybe third party) was not a possibility in any circumstances. shield the ball with the stick to prevent a legitimate tackle. Players who run in front of or block opponents to deny them the legitimate and feasible opportunity to play the ball are obstructing. This can happen, for example, at penalty corners when attackers run across or block defenders including the goalkeeper. 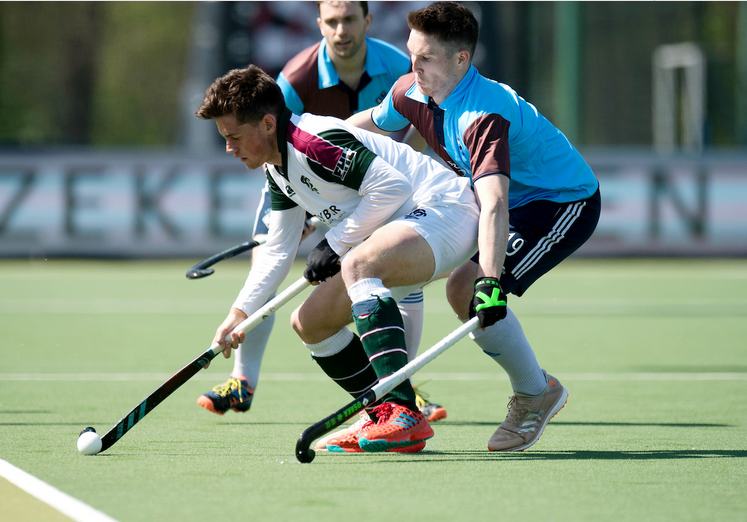 forcing an opponent into obstructing, often emphasised by running into an opponent or by waving the stick over an opponent’s head. This action should be penalised. In 2004 there was a reformatting of the rule-book (a new book size) and a major rewrite, which was described as a simplification and clarification, but consisted largely of deleting previous Rule clauses and all previous Rule interpretation. The additional criteria added in 2002 were not, as had been expected they would be, included in “Players obstruct if they:-” they were simply deleted. The Rules Interpretations previously given in the back of the rule-book before 2004 just disappeared. The Obstruction Rule and provided Rule Interpretation was then comparatively sparse. 9.10 Players must not obstruct an opponent who is attempting to play the ball. The original “must” now became “is permitted to”, following the change to “may” in 1995. I have no idea why “is permitted to” replaced “may”, it seems an unnecessary change as both have exactly the same meaning, but the FIH HRB could then declare that an amendment had been made to the Obstruction Rule and put a line next to it in the text of the rule-book, even though they provided no reason for the change and the change had no significance. The word “away” was also replaced, with “off” (which does not mean away); this was a fudge which has been interpreted to mean that a player in possession of the ball is allowed to move towards (even into the playing reach of an opponent trying to make a tackle attempt) while shielding the ball, despite that being a contradiction of one of the criteria (back into) for an obstruction offence. There was one amendment made to the Rule Explanation in 2009. Nothing else in the Obstruction Rule was changed. This clause:- A player with the ball is permitted to move off with it in any direction except bodily into an opponent. Few umpires appear to be aware of this last amendment to the explanation of application of the Obstruction Rule; in fact it added nothing that was not already in place and was generally ignored. Perhaps the FIH HRB wanted to be seen to be doing something, anything no matter how futile, about the way the Rule was (not) being applied. There are still some very peculiar opinions about what is and is not obstruction being coached to umpires, prospective umpires and to players. Commentary to the video below is absurd. Another way would have been to consider the positioning and other actions (including stationary ball shielding) by player in possession of the ball and also of a player in the act of receiving the ball. To have done so would have made more sense as we already have separate Rules which prohibit any form of physical contact – and it is not possible to rule about the position a tackler needs to adopt to make a tackle attempt (e.g advising or insisting that a tackler should “go around” is inappropriate, actually stupid). The existing Rules, which forbid all physical contact, are sufficient to deal with any physical contact. Once physical contact is taken out of consideration under another Rule (e.g. 9.3 or 9.13). The Obstruction Rule can and should be about preventing obstruction; that is what a player must do or not do to avoid obstructing an opponent: which is preventing an opponent playing directly at the ball when he or she is within playing distance of the ball and would otherwise have been able to play at it. It was an error (to put it mildly) to introduce in 1987 the idea that could be interpreted to mean that a stationary ball holder could not obstruct an opponent. The error was compounded by swinging back and forth, next, in 1993, demanding movement away by a ball holder who had received and controlled the ball, removing that demand in 1995 (may move away), then reimposing it (watch for stationary ball shielding when under pressure) in 2002, and then (perhaps?) removing it again (is permitted to move off) 2004. This sequence gives a sense of disagreement and discord within the FIH HRB, which there can be no doubt existed (still exists?) and was surpassed in absurdity only by the ‘gains benefit’ fiasco of January and February 2007. The original (1987) clause, which appeared to sanction stationary ball shielding (even if the ball was being moved), has not appeared in a Rule or Rule Interpretation since 1992, but it is still regularly trotted out as if current interpretation or even part of the Obstruction Rule. Many umpires will not penalise a player who is shielding the ball to prevent an opponent making a legitimate tackle attempt if that player is stationary and/or is moving the ball. There is now no clear justification for this approach to the offence but, years of “simplification and clarification” have left us with a vague and ambiguous wording of the Explanation of Application for which many interpretations are offered and ‘in practice’ obstruction offences are virtually ignored. The game has suffered as a spectacle, it is at times actually ugly to watch, and so has the general level of stick/ball skills because ball shielding with the body requires little stickwork skill. Only the last two incidents shown in the video below were penalised (and then one of them with a penalty corner when a penalty stroke should have been awarded) I can find no rational reason why obstruction, even when combined with a physical contact offence, is so frequently ignored. I have a few, but very few, videos showing an umpire penalising an obstruction offence, so there is some ground for supposing that umpires are (or should be) aware of the existence of the Obstruction Rule, but no rational explanation of their general refusal to apply it – other than that they find it difficult to do so (because it is not what their peers are doing) – it is easier just to ignore offences, in spite of the frustration this causes to players who are obstructed and the incidents of physical contact that result from this frustration. One of the reasons for the difficulty umpires encounter is the absence of a clear definition of obstruction within the Obstruction Rule and the absence of criteria – similar to those introduced in 2002 – to use as a guide to correct application. There have been no amendments made to the Obstruction Rule since 2009 but ‘interpretation’ is ‘a runaway train’. The Obstruction Rule needs to be rewritten without the previously embedded and hidden conflicts and with clear definition and criteria, here is an attempt to do that. all but the last two obstructive incidents were ignored by the umpires and even then, the penultimate one was revered on video referral after the silly award of a penalty stroke and the other, the last, was only penalised after several seconds, when a second opponent was obstructed in the same way as the first one continued to be. The penalty given was a penalty corner and not the penalty stroke that should have been awarded. A player with the ball is permitted to move off with it in any direction EXCEPT bodily into an opponent or into a position between the ball and an opponent who is within playing distance of the ball and attempting to play it. (my bold and upper case). Restating the last clause above in its parts and in the prohibitive format previously used. move into a position between the ball and an opponent who is attempting to play at the ball. …….do not require that an opponent (a tackler) be attempting to play at the ball at the time of the given action. This is reasonable because backing into the playing reach of an opponent (forcing retreat to avoid physical contact) or physical contact/interference by a ball holder with an opponent who is trying to position to tackle could make a tackle attempt impossible or make an attempt to tackle unfairly difficult. physically interfere with the stick or body of an opponent. (that is ball shielding to prevent a tackle attempt without there being any form of physical contact). The unsatisfactory answers to How? and Why? are “Interpretation” and “The acceptance of this interpretation”. But where do these interpretations come from? That appears to be anybodies guess. I can’t see any reason that the interpretations of the actions seen in the video clips (that ‘saw’ nearly all of them as legitimate play) should be accepted by anybody, because such interpretation is clearly contrary (provided word meanings remain consistent) to what is given in Rule 9.12 Obstruction. Are word meanings reasonably consistent? Is it likely (probable) that A player shall not move bodily into an opponent has several meanings in this time and place and one of them is that players are permitted to move bodily into an opponent – and, irrationally, that is the one used in hockey? If this is so we can despair of ever having a written Rules of Hockey that is adhered to. ∙ the onus is on the tackler to be in, and if necessary move to, a position from which a legitimate tackle can be made. Once in the correct position the following conditions must also be satisfied before obstruction can occur. ∙ there must be an intention to make a tackle. in essence the tackler must be attempting to move the stick towards the ball. ∙ the timing of the tackle must be precise because, until the tackler is in a tackling position and intending to make the tackle, the player with the ball may move off with the ball in any direction (except bodily into the tackler). This interpretation of obstruction allows players to receive a ball, play or pass it in any direction, and only to be penalised if obstruction takes place at the time a properly placed tackler tries to make the tackle. However, umpires should note certain forms of obstruction which are often incorrectly overlooked. In particular, preventing a legitimate tackle by intentionally shielding the ball with the body or leg is obstruction. Stick obstruction and interference is prohibited; no player may strike at or interfere with an opponent’s stick. The player with the ball may not use the stick to shield or protect the ball from a legitimate tackle. To be fair, the above interpretation was written about the exemption from the Obstruction Rule of a player who was in the act of receiving the ball, and it was not intended as an interpretation of obstruction at all (which remained exactly as it had before 1993. What constituted an obstructive action, the criteria for obstruction, continued to be exactly as it had been previously) but as an explanation of an exception to the Obstruction Rule, vis-a-vis tackling, when the ball was being received by a player: the dramatic change the author sat down to write about and mistakenly called a new interpretation. This ‘new interpretation’ was very quickly being applied to a player who was already in controlled possession of the ball – not at all what was intended to be taken from what was written in the first four paragraphs above – and this mistake became universal as it was copied and ‘cascaded’. Why there was differentiation made between a stationary receiving player and a moving receiving player, I can’t even guess. A more sensible differentiation could and should have been made between a player already in controlled possession of the ball and a player receiving the ball – moving or stationary. The stationary/moving divide only confused participants further because there is in fact no difference in the application of the Obstruction Rule between them. The part about a player already in controlled possession of the ball begins at paragraph five with “However, umpires should note certain forms of obstruction which are often incorrectly overlooked. In particular, preventing a legitimate tackle by intentionally shielding the ball with the body or leg is obstruction.” and that paragraph is all the attention body obstruction by a player in possession of the ball (the most frequently contravention) gets in “the new interpretation” – and it is mistaken, bringing into consideration for the first time an intention to illegally shield the ball from an opponent, which has never been a consideration. Shielding the ball can be obstruction, but as an obstruction offence must be forced by an attempt by a tackler to play at the ball, intent to obstruct is irrelevant if there is obstruction. In 2001 the words in the first paragraph “and if necessary” were deleted (I don’t know for certain why, there was no explanation offered at the time, but the cynic in me can make a guess). The 1993 ‘interpretation’ otherwise remained, as presented in part above, until the rule-book was re-formatted and rewritten in 2004 – when it was deleted. Hockey coaches and umpires in the meantime (and since, despite its deletion) have used this ‘interpretation’ to destroy the game by coaching and applying it inappropriately. But this damage limitation attempt, the last amendment made to the Obstruction Rule by the FIH Hockey Rules Board, was too little too late (the penalising of obstruction had practically vanished by then) and most umpires today seem to be unaware of it – never mind to be applying it. This is generally because they are still applying the interpretation of ‘attempting to play at the ball’, extent up until 2003 (which was as explained above originally intended to be applied to a player attempting to tackle an opponent who was in the act of receiving the ball – the ‘interpretation’ came instead to be about the positioning of a tackler and not about a player committing an obstruction offence). This ‘interpretation’ (which included the pre-2004 version) was handed down by word of mouth from older umpires to those taking their places with all the personal opinion, inconsistency, variation and mistake such a method of communication enjoys. The only mention, following the 2004 deletion and rewrite, the revolutionary exception of 1993 gets in the 2009 (and the current) Obstruction Rule, is a statement that a stationary player receiving the ball is permitted to be facing in any direction. How’s that for clarification? The current, mistaken, view, ‘interpretation’ coming from that statement, is that a player in possession of the ball may at any time be standing facing in any direction regardless of the positioning of opponents and the position of the ball; not at all what the Rule now stipulates and not what was intended in 1993. This note describes two primary playing circumstances: the stationary player and the moving player. No tackler with any common sense is going to try to tackle by moving around a stationary opponent in possession of the ball – the ball holder will of course just turn away in the opposite direction and into the space just vacated by his or her opponent. This interpretation just set up a situation where a single tackler could not tackle a competent player who had possession of the ball and who was prepared to shield it and wait for a tackle attempt or for team support (it slowed the game and ‘holding’ the ball in the corner of the pitch or against a base-line or side-line became a common tactic). The above Interpretation was deleted in 2004. Only this fragment of it remains in current Rule. Cris Maloney an American umpire coach is currently coaching what he says FIH Umpires are doing, that is going beyond the above ‘stationary player’ statement to include a player in possession of the ball and also allowing a ball holder to move backwards towards an opponent while shielding the ball from that opponent – as long as the ball holder does not make physical contact with the opponent – which is his own interpretation. But it is clear from the video posted at the head of this article that that ‘interpretation’ is ‘old hat’. FIH Umpires have for many years been allowing full-on contact by a player who is receiving the ball or who is in controlled possession of the ball – it’s only an opponent who positions to block the ball or who attempts to tackle such a player, who risks being penalised – for impeding or physical contact. The application of the Rules – some Rules more than others – is in a state of anarchy. The back-into interpretation presently being promoted by Cris Maloney et al was but a step along the way. Hockey has generally become ugly and less, not more skillful, as it should have done, over the last twenty-five years. Oh, we see videos of people with amazing juggling skills practicing in uncontested situations, moves that are not legal in a hockey match, but the free-flowing passing and dribbling game, the ‘new interpretation’ was supposed to herald an expansion of, has all but vanished. The fact that defenders can shield the ball and move with it while shielding it without any fear of penalty, equates with the unwelcome turning, shielding and barging tactics of attackers trying to penetrate the shooting circle in possession of the ball and turns hockey into a farce, a game without properly applied Rules. Attempting to play the ball. There are two videos about obstruction presented by the FIH Umpiring Committee via dartfish.com which refer to an attempt to play at the ball. The ARG attacker enters the 23 metres area and just before she reaches the edge of the circle plays a pass which is intended for her team mate. The GER defender tries to intercept the pass, but the ball deflects off her stick. The GER defender regains control of the ball. The second ARG attacker tries to claim that she is being obstructed. The Umpire allows play to continue, because at no point did the second ARG attacker ever legitimately attempt to play the ball. The GER player who blocks the ARG player who is trying to move towards the ball clearly commits three offences 1) physical contact 2) Interference 3) Third-party Obstruction and whoever wrote the above interpretation, supporting the decision made by the match umpire, lacks not only Rule knowledge but common sense. There was no attempt by the ARG player to play at the ball because she was illegally prevented from getting to within playing distance of the ball when trying to do so. The GER team try and pass the ball out of defence. The GER player receives the ball and initially moves it out of the playing distance of the ARG player. When the GER player turns with the ball, the ARG player is not actively trying to tackle or play the ball, so there is no obstruction. When the GER player plays the ball over the stick of the ARG player, it runs out of her playing distance for an ARG side-line ball. The contact between the two players’ sticks is accidental and does not affect play. There is a substantial chunk of the action missing from the actions described in the provided interpretation which can be seen in the video. I have embedded comment in my remake of the video and included slow-mo of the relevant action. Both of the above interpretations, which declare no tackle attempt was made, are absurd, taking no account of the prevention of a tackle attempt or the illegal thwarting of a tackle attempt as it was in progress (initially, in the second video, by stepping over the stick of the player attempting to tackle as she was reaching for the ball and bodily blocking her path to it). Both interpretations support the decisions made by the match umpires: what a surprise !! My previous objections to the inclusion of these two videos (and many others) presented as umpire coaching go back to the launch date of FIH Umpire Committee sponsored coaching on the Dartfish website – a potentially great coaching tool is being mismanaged and wasted by those responsible for producing the interpretations, mainly because they ‘bend over backwards’ to support decisions made by match umpires no matter, as in the two examples above, how mistaken they were. Cris Maloney refers in his coaching session (see link below) to “What FIH Umpires are doing” as justification for the interpretation he is coaching. Here is an example of what they are doing. This umpire allows the NED defender to ‘crab’ along the base-line and to move into the playing reach of the GER forward while – deliberately – shielding the ball from her opponent and thereby preventing an attempt by that opponent to make a legitimate tackle.The GER player would immediately have been able to play directly at the ball if the NED player had not shielded it from her in the way that she did. (moving along a line in this way was an action which umpires were advised to watch for (penalise) up until 2003, when it was deleted from Advice to Umpires without comment. This instruction needs to be restored to the Explanation of application of the Obstruction Rule – along with 2) turning into and pushing past, and 3) standing still and shielding the ball when under pressure – the latter also seen in the video – described ‘watch for’ actions which were deleted at the same time as shielding the ball while moving along a line was). The umpire does not penalise until a second GER forward attempts to tackle for the ball and is also obstructed in the same way while the first one continues to be obstructed. The penalty awarded was a penalty corner and not as it should have been, because there was nothing accidental about this obstruction, a penalty stroke. The obstructing player obviously had no idea she was committing an offence. Why not? Common sense should have told this umpire that a deliberate obstruction offence was occurring ‘right under her nose’ long before she did intervene. This following example is worse, the umpire awards the offending NED player (who commits three offences) a free ball. Cris Maloney (https://martinzigzag.wordpress.com/2018/02/10/a-peculiar-interpretation/) would doubtless have seen the first action by the NED defender after he got possession of the ball as backing into, because there was physical contact, but the FIH Umpire concerned did not. Why not? Will Cris Maloney eventually follow what this umpire, and others, are doing? On the above evidence, basing Rule application on a clear understanding of the written Rule, obtained by using literal interpretation of the wording, is more likely to produce sensible decisions than copying what other umpires are doing, no matter what level they may have reached, because it is often impossible to know why they are doing what they do – and the “Why?” or “Why not?” is important. I doubt that the umpire who made the above decision could explain why he did not penalised the NED player for obstruction and/or physical contact, the offences could hardly have been clearer and the written descriptions of them in the Explanation of application of Rule 9.12 are clear enough to be fit for purpose if common sense is also employed. I hope no other umpires will follow these examples. Cris Maloney is a well known, enthusiastic, and well liked umpire coach in the USA. He has produced a number of videos and written three books on the playing and umpiring of field-hockey. He has also been involved with Steven Horgan (the Pan American representative Member of the FIH Rules Committee since 2017) in the production of the USA Field Hockey Rules Briefing videos since 2012 – so he should know what he is talking about (even though there has not been a single mention of the Obstruction Rule – the subject of this article – in the USA Briefings for as far back as I have been able to track them: so no mention since at least 2012). It is therefore something of a surprise to discover that he has concocted a bizarre interpretation of part the wording of the Explanation of application of the Obstruction Rule (that turns the Obstruction Rule ‘on its head’) and which he presented in a pre-2017 season coaching session at Eastern. The video clip below is a small segment of that session. He then, after describing backing in as a contact offence, asks a player to back into him in demonstration, and declares when she does as she is asked, that she is not backing into him (but backing up), as he retreats behind her, because she does not make contact with him. When he stops retreating and the player does back into physical contact, he then declares that she is backing in and therefore obstructing him. The flaw in this reasoning should be obvious as the player with the ball simply continued with exactly the same action – but he did not. The question that needs to be addressed is “Does ‘back in’ mean backing into physical contact?” Without additional information it is not possible to determine that because the term is ambiguous. Certainly (as Cris Maloney pointed out) someone who backs into another car hits that car. But, someone who backs into a parking bay or a garage does not normally keep going until they hit something – the terms used are the same and both interpretations can be correct, meaning clearly depends on the context in which the term is used. It is therefore necessary to go to the published Rule to see if there is other wording within the Explanation of application to support the contact interpretation or to make it doubtful or to contradict it. There are other criteria described and I will set them out without setting out the entire Explanation of application, Third Party etc. The last clause needs breaking down to highlight its component parts. A player with the ball is permitted to move off with it in any direction except bodily into an opponent which can be accurately transcribed into the previously used prohibitive form: – A player with the ball is not permitted to move bodily into an opponent. and A player with the ball is permitted to move off with it in any direction except bodily into an opponent or into a position between the ball and an opponent who is within playing distance of the ball and attempting to play it. transcribes to become A player with the ball is not permitted to move into a position between the ball and an opponent who is within playing distance of the ball and attempting to play it. move to position between the ball and an opponent who is within playing distance of the ball and attempting to play it. I believe the separate listing of ‘back into’ and ‘move bodily into’ call for different interpretations of the two terms. Because a player may be obstructed once that player is within playing distance of the ball, ‘back into’ can reasonably be interpreted to mean ‘back into the playing reach of an opponent’ and not only or just, back into contact. The separate ‘Move bodily into an opponent’, which is otherwise unnecessary, is then justified as a different action from ‘back into’. Why then is another action described separately ‘move to position between the ball and an opponent who is within playing distance of the ball and attempting to play it’. listed ? Is this not unnecessary duplication? No, one reason is because it is possible to turn (move) into a position between an approaching opponent and the ball without backing towards that opponent and a second, important one, is that if a ball holder is moving into an opponent while shielding the ball – which is likely if there is ‘backing in’ or ‘moving bodily into an opponent’ – it is not necessary for the opponent to be attempting to play at the ball at the time for there to be an obstruction offence; this requirement is omitted from the first two criteria listed in the Explanation to the Rule. That is a reasonable interpretation because if a player is forced to back away from a moving ball holder to avoid physical contact or has been barged into by the body of the ball holder, an attempt to play at the ball may have been made unfairly difficult or impossible (prevented) by either of these actions. A difficulty with interpretation might disappear if the Explanation of application was clarified to read – back into the playing reach of an opponent. but I think it better to expand the clause to include all leading of the ball into the playing reach of an opponent while shielding the ball from that opponent to prevent direct playing at the ball: this would include the common ‘crabbing’ actions – leading the ball with shoulder and/or hip and with a leg. So:- A player obstructs if leading the ball with any part of the body into the playing reach of an opponent, while shielding the ball to prevent that opponent playing directly at it. Cris Maloney also presented some very strange ideas in the coaching session (shown in the video below) which appear to be based on this clause from the Explanation of application:- A stationary player receiving the ball is permitted to face in any direction. They are strange because that clause refers only to a player who is in the act of receiving and controlling the ball. A player in possession who is not in the act of receiving and controlling the ball is subject to a player shall not shield the ball from a legitimate tackle with their stick or any part of their body and must, when in possession of the ball but not in the act of receiving and controlling it, take account of the positioning of opponents to avoid an obstruction offence, i.e such a player is not always permitted to be facing in any direction. The shielding clause applies whether a player who is shielding the ball from an opponent is stationary or is moving at the time. That is something Cris Malone mentioned but did not expand upon when he referred, at the beginning of the first video clip above, to players who were moving the ball or moving with the ball. In fact the only times, other than when in the act of receiving and controlling the ball (receiving is not ‘in possession’) , a player in possession need not be concerned about the positioning of opponents vis a vis the possibility of obstruction, are when there is no opponent within playing distance of the ball or no opponent rapidly approaching who will be within playing reach of the ball before it can be put into an open position or when the ball holder and the ball are the opponent’s goal side of any opponent, (which includes any opponent who is within playing distance of the ball). An opponent who is ‘behind the play’ as described (behind – not own goal-side of – both the player in possession and the ball) cannot, no matter how close he or she may beto the ball, be bodily obstructed by a player in possession of the ball (but obstruction of a tackler’s stick, by ‘protecting’ the ball with stick or leg or hand/arm, is still a possibility). 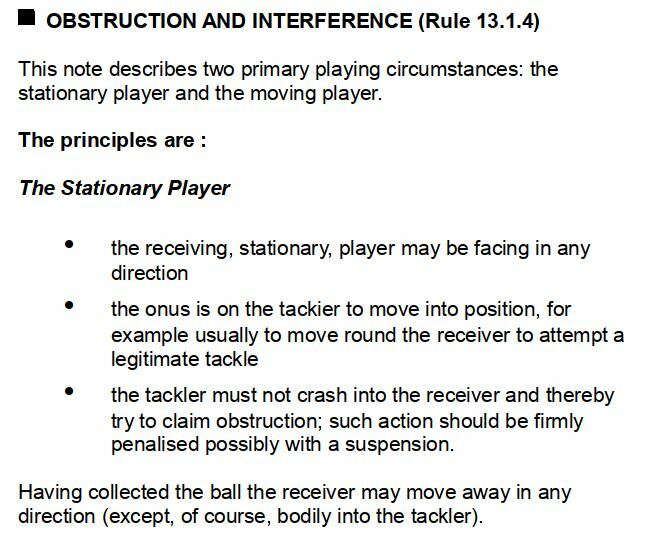 Whether or not a player in possession of the ball is in “a legal position” or is “still in a legal position” when an opponent is attempting to make a tackle does depend on how they respond/position when a tackle attempt is made. The correct response when the group were asked “Is she still in a legal position” as a tackle attempt was demonstrated to be blocked by the body of the ball-holder was “NO”: Cris Maloney should have been explaining why it was “NO”. The “Yes” reply was an example of ignoring cognitive dissidence (between Rule wording and action) or of wilful blindness. The Obstruction Rule is intended to put pressure on a player in possession of the ball to encourage movement with the ball (dribbling and stick-work) and movement of the ball (passing) – and to discourage physical contact, illegal ball shielding and static ‘play’: it by these means promotes game flow and all aspects of skillful play. ‘Diluting’ the criteria for obstruction does the opposite: it ‘dumbs down’ the game so that very little skill is needed to keep possession of the ball. The result is that many players, who are coached to shield the ball whenever possible and do so ‘automatically’ in contested situations, do not develop necessary stick-work and footwork skills or passing skills to properly (legally) play the game. There is not much backing in taking place during the boring action shown in the video below, so what is seen complies with Cris Maloney’s view of “not obstruction” – but not with what is written in the Rules of Hockey Rule 9.12.- besides it not being Rule compliant, could anyone want hockey to be played like this? The answer to that last question is possibly “Yes”. Now nearly everyone plays hockey like this because this, despite Rule 9.12, is the way it is umpired. (which is the justification Cris Maloney has offered to me for his coaching of obstruction) Are umpires umpiring as ‘everybody’ wants them to or only as umpires want to? In the following video there are many clips showing players shielding the ball while leading it into an opponent in a way that obliges that opponent to give way to avoid physical contact or moving into body contact (sideways or backwards) while ball shielding or alternatively, going over the ball and barging into an opponent. Only the last two incidents were penalised for obstruction, the first of them the reversal, after video referral, of a silly penalty stroke decision made by the match umpire, and the second, after a long delay, when a second player was obstructed in the same way as the first one continued to be – and even then the penalty awarded was a penalty corner and not, as it should have been, a penalty stroke. What Cris Maloney is currently coaching is at least two steps ‘behind’ what is now permitted, contrary to the Obstruction Rule, by FIH Umpires. To rescue the game we need to go back three or four ‘development’ steps, to where ball shielding to prevent an opponent playing at the ball, when he or she would otherwise have been able to do so, was considered an obstruction offence, and opponents were eluded or ‘beaten’ by passing and stick-work skills rather than, commonly, by barging and body blocking. We are no longer trying to understand the wording used in the Obstruction Rule; we are trying to understand the umpiring which is supposed to be based on the provided wording, but clearly is not. What the above umpiring is based on is a mystery.